1 of 4 Heat oven to 400 degrees F. Place squash halves, cut-side down, on a 15 x 10 x 1-inch baking pan. Add 2 cups water, and transfer to oven. Bake at 400 degrees F for 35 minutes. 2 of 4 Meanwhile, put bulgur in a bowl. Pour 3/4 cup boiling water over bulgur; cover with plastic wrap. Let stand 30 minutes. 3 of 4 Once bulgur is softened, heat a nonstick skillet over medium-high heat. Add sausage; cook 2 minutes. Stir in garlic powder and red pepper; cook 3 minutes. Remove from heat. 4 of 4 Stir in bulgur, chili sauce and 1/8 teaspoon of the salt. Remove squash from oven; pour off water. 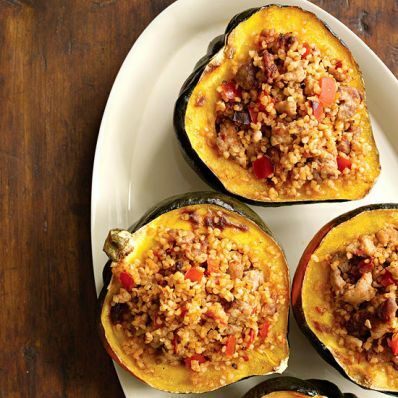 Flip over squash; brush with maple syrup. Season with remaining 1/8 teaspoon salt. Spoon filling in squash; return to oven. Bake 10 minutes.